The 27.63 metre motor yacht Solstice I, listed for sale by Tucker Fallon at Bradford Marine Yacht Sales, has been sold with Julie Annette at Massey Yachts introducing the buyer. Built in aluminium by Canadian yard Dover Marine, she was delivered in 2001. An interior in cherry wood accommodates eight guests in four cabins consisting of a master suite, two VIP suites and a double, all with entertainment centres and en-suite bathroom facilities. In addition three crew are accommodated in two cabins. The saloon and dining area are open plan, with large windows, a lounge area aft and dining area forward separated by an island credenza. The lounge area offers comfortable relaxation on leather settees and an ottoman in front of an entertainment centre including a large television screen, while the dining area has an oval table and high backed leather chairs seating eight guests. Storage for china, glassware and silver is located on the forward bulkhead. Further forward the country kitchen style galley hosts a U-shaped banquette for casual breakfasts and snacks. The sheltered aft deck has a fixed lounging area with a large rectangular teak table and chairs, ideal for al fresco dining. Up on the flybridge is a custom GRP hard top with ample head room, a helm station, full service bar and a barbecue grill with a dining area. Twin 1,480hp MTU diesel engines give her a cruising speed of 12 knots and she is fitted with Naiad zero speed stabilisers. 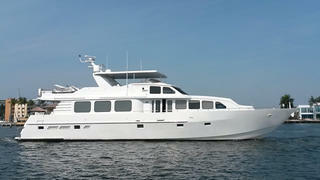 Lying in Fort Lauderdale, Florida, Solstice I was asking $899,000.